As I am painting I am in His perfect peace, hidden in the cleft of the rock. The name for this painting is "Intertwined as One". Did you know the word intertwine means to connect, to join together, to unite or become joined by twining one with another. God is asking that we may all become one with Him - intertwined with Him in an everlasting bond of love. 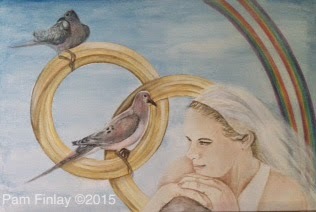 I was given to paint two turtle doves, two golden wedding rings intertwined, a double rainbow and the bride of Christ. The number two keeps being repeated. Two is the number of witness, testimony. Many scriptures mention about the two doves. The doves were used in the Old Testament for atonement of sins. They are mentioned in the gospel in the New Testament when Jesus was born, at his baptism and just before his death. The scriptures in the gospels of Matthew, Mark, Luke and John are the ones that I think of when Jesus was baptised by John the Baptist in the Jordan river and the Holy Spirit came from heaven and descended on him "like a dove", the presence of God. The doves are symbols of lovingkindness, meekness, pure devotion and peace. Springtime brings abundant new growth and blossoms appear on the trees and in comes the two doves. Their sound can be heard all over the land. The Lord is drawing us into that covenant relationship of pure love and devotion. The doves sing His praises when the sun rises early in the morning, welcoming in the new day. The two turtledoves are His love story. The moment of the singing of the birds has come, harvest time is the time when the sound of the turtledove can be heard in the land. A new day is dawning. The dove is a serene creature, her beautiful plumage, the peacefulness and gentleness that she exudes. Her dwelling place is in the cleft of the rock. Did you know that doves mate for life. They are incredibly loyal to one another. The double rainbow represents God's covenant promise and the signs and wonders that he is showing us. The intertwined wedding rings represent holy matrimony, the coming together of the bride and the bridegroom. Two becoming one, united together in faith and oneness of mind. One in Spirit and truth, one in love. Perfect love. I thank you Jesus, you sacrificed your life so that we could experience the fullness of your perfect love. You are transforming us.